Kenya 7s finished Cape Town 7s on a high beating Wales 33-26 to win the 13th place playoff- formerly Shield- on Sunday Dec 9, 2018 in South Africa. In-form Johnstone Olindi bagged a hattrick in the win with Cyprian Kuto and Leonard Mugaisi also touching down as Daniel Taabu converted four of those. By finishing 13th, Kenya 7s pick three points from the Cape Town 7s leg which is two more than they picked in Dubai last weekend. Kenya had beaten Zimbabwe 31-19 in 13th place semis after losing to Argentina in challenge trophy quarters earlier on the day. 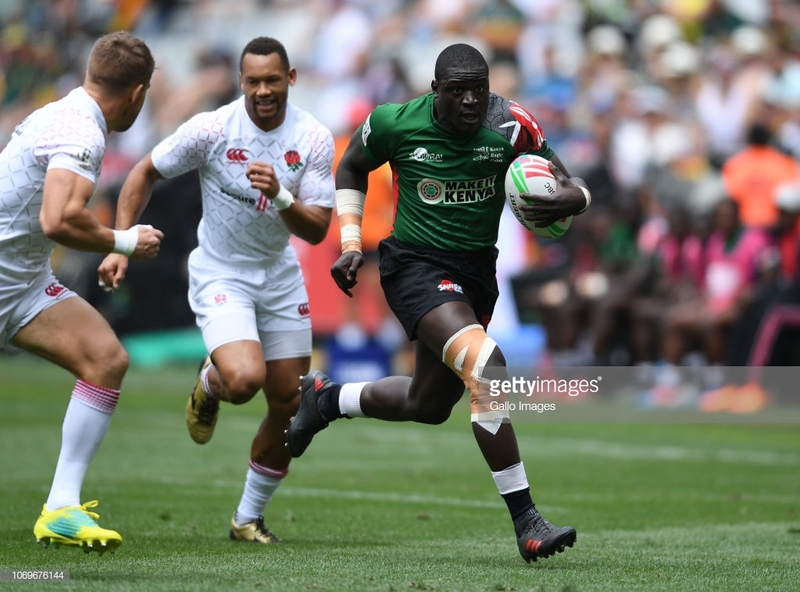 On Saturday, Kenya went down 19-12 to France, 29-12 to England and 38-7 to Fiji in pool C.
Next assignment for Kenya 7s is Hamilton and Sydney 7s in 2019 where head coach Paul Murunga could be boosted by the return of internationals like Collins Injera, Sammy Oliech, Andrew Amonde, Nelson Oyoo, Willy Ambaka and Billy Odhiambo. Kenya needed just 19 seconds for Johnstone Olindi to drive around the outside of the Welsh defence for a great start. Owen Jenkins, however, hit back immediately! He had an open try line ahead of him thanks to some excellent play from Ben Jones to complete a thrilling opening two minutes in Cape Town. Tomi Lewis managed to shrug off two Kenyan defenders and ran 75 metres to take the ball home and put Wales in front. Wales had a lineout, and Charles Omondi was clutching his left shoulder beside the touchline after a heavy tackle from Afon Bagshaw. That was followed by a wonderful cover tackle from Daniel Taabu to bring down Ben Jones, but Wales recycled and Jay Jones was able to touch it down. It was a good end to the half for Kenya, with Cyprian Kuto accelerating down the right wing and around the outside of the Welsh defence even though they missed the conversion so went in seven behind. Olindi spotted a hole in Wales' defence after Jay Jones slipped trying to tackle and Kenya were 19-19 level! The Homeboyz fly-half had another brilliant stretch to complete his hat-trick. He managed to reach the line after a tackle from Will Talbot-Davies to see go seven ahead. The referee looked ready to call a turnover to Wales, but Leonard Mugaisi wasn't prepared to let them have it so easily. He had a break out from the ruck and there was nothing to stop him diving across the try line. There was a lovely support line from Luke Treharne, who came inside Will Talbot-Davies on the right wing, but the hooter had already gone. Wales got the try and conversion but lost to Kenya.